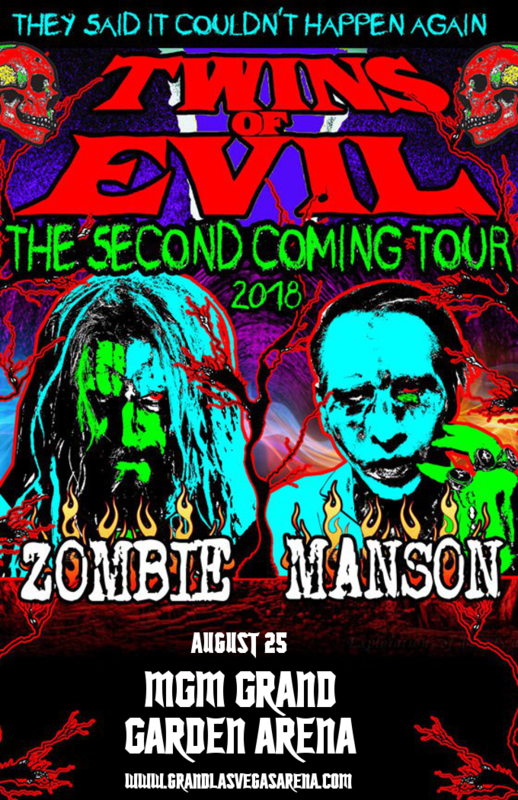 Get ready for a MASSIVE announcement, metal fans – the MGM Grand Garden Arena is proud to present the Twins Of Evil: The Second Coming Tour – that’s right, the nefarious duo of Rob Zombie and Marilyn Manson are playing Las Vegas on Saturday 25th August 2018 – it's going to be a hell of a show! Don’t miss out – get tickets now! Scaring parents and defying convention since 1994, Marilyn Manson is one of the greats of shock rock, with a distinct musical style that has influenced countless artists since. His latest album, “Heaven Upside Down,” was released last year, and unlike his previous record, “The Pale Emperor,” which featured a more low-key, chilled out vibe, returns to the visceral angst and fury of his younger days. Fans of the “Antichrist Superstar,” era will have much to love at the live show. So what are you waiting for?? Get your tickets today!